The biggest quality of Shinshu Cutlery from Nagano is in its strength, trenchant blade, and that it’s long-lasting. This comes from long hours of forging the blade one by one. The name of the blade ‘Shinshu Cutlery’ comes from its origin ‘Shinshu-koku (Country of Shinshu)’, which was an old name given to Nagano city, the venue of 1998 Winter Olympics. Forged cutlery is of a higher quality, and a completely different knife from cheap cutlery (Nukihamono) that are made through pressing and abrasion process. 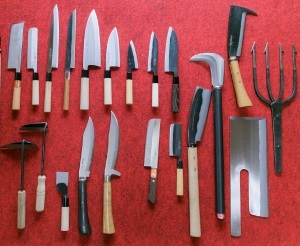 The main products of Shinshu Cutlery includes farm tools such as sickle and hoe, forest tools such as machete and ax, and kitchen knives. The Shinshu Cutlery with the highest reputation however, is the Shinshu sickle. The reputation comes from its quality features such as ‘Shibatsuke’, a feature in which the chopped grass naturally comes closer to the hand of the user; and ‘Tsuri’, which creates the curved shape of the sickle and prevents it from missing the aim. Additionally, it is very easy to use because it adopts a thin, double-edged blade. 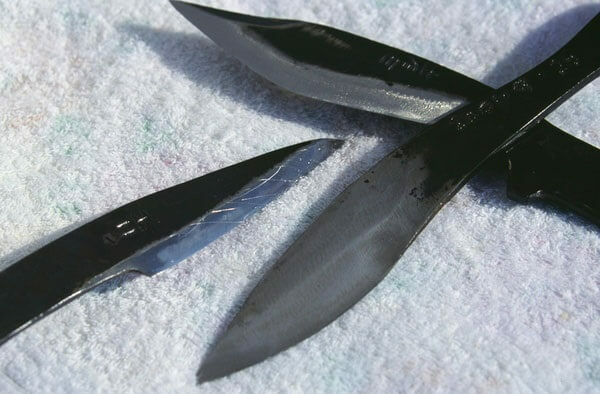 The technique to produce Shinshu sickle is said to have been developed during the early 19th century, and those techniques continue to be used by the blacksmiths today. 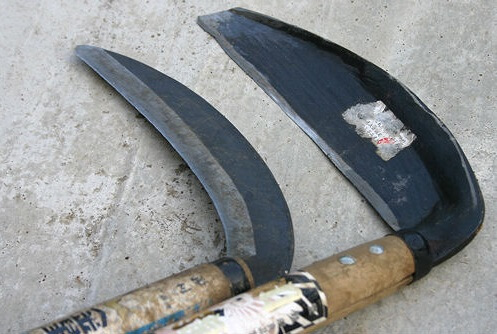 Until the end of World War II when agriculture becomes modernized, Sickle was a very important tool, and had been used traditionally in common Japanese households. For Japanese people whose main diet was rice, sickle was a necessity for rice farming. Even today where everything is modernized, people still use the sickle in places where machines cannot go in. 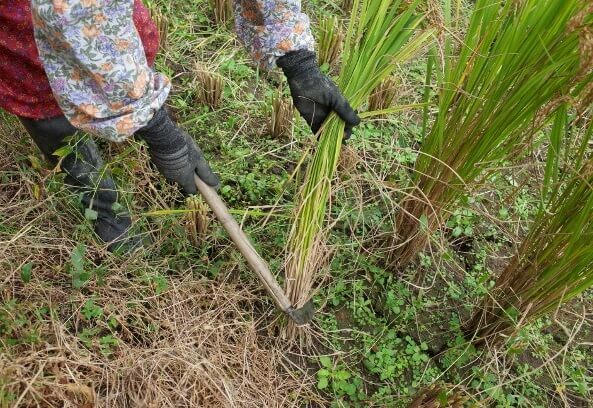 As shown in the above, in order to use the sickle, you bundle the rice plant with it, grab the plants and cut them off diagonally near where the root starts. To allow the sickle to cut inward, the edge is on the inside of the curved blade. 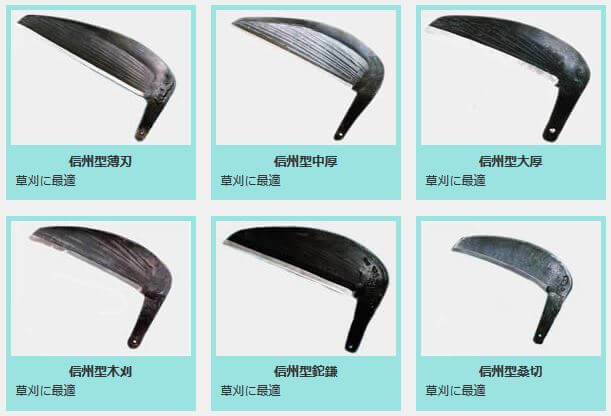 Compared to other sickles from outside Nagano, Shinshu Sickle has a wider blade and looks heavier. But once you hold it, the sickle feels much lighter than it seems. The secret is in the long hours of forging with care and delicacy. Some people call it the ‘Razor Sickle’ because of its unusual sharpness, convenience, and durability. Thus, the producers of Shinshu Sickles have their own aesthetics, which is to specialize in functionality by focusing on thin blades. That is why they are able to make products that are still loved by other craftsman.